All persons have dreams. Special adults are no exception. At Emma's Education Center, our students dream of all the wonders that life has to offer them, and with a little help from us, they are achieving those dreams. We are doing something different. We are working one on one with our students and their families to achieve attainable goals, executed by our certified special education teachers and our para-educators. Though we may look like a day habilitation Center on the outside, on the inside there is so much more going on! We are a 501(c) 3 Public Charity School. Our program is open to adults with intellectual and developmental disabilities of any age and any learning level who want to continue to go to school or any high school special education students who need an after school program! Autism, Down's Syndrome, Traumatic Brain Injury, Cerebral Palsy, they are all included! We are meshing LIFE skills with academics...and it's working! We accept HCS Levels 1, 5, and 8. Level 6's are on a case by case basis. We accept private pay, HCS, TxHmL and CLASS. Toileting is not an issue and should never be in a day program. All our students need a little help and we're here to give it. Because of the way our program is structured, as well as how our Center is put together, we cannot accept any students with extreme or violent behaviors. Students must be able to sit for at least 15 minutes at a time as school work is the focus in the mornings. The dream began with Emma. Emma completed her last year of high school in Garland ISD in 2015. She was 22 and "aged out" of the District. Emma LOVES everything about public school. It was where she belonged. Moderate functioning, but not enough to be independent or employable, the dilemma was where Emma could go that would allow Mom to work and Emma to develop into a capable adult. There weren't many choices out there. Adult Day cares were not an option. Many dayhabs had her sitting all day waiting to be picked up. Faced with the dilemma, Emma's Mom wanted more for her. Led by Mom, the Board of Directors formed Emma's Education Center on April 7, 2014, opening its doors to the public on August 24, 2015. Emma is thriving once again. Emma's Mom wants the same opportunity for Emma's friends. Emma's Education Center is a structured, academic based education and LIFE skills training center for adults with intellectual and developmental disabilities. Just like the services they had in high school--that's what they are receiving here. We are making a difference. That's something we're proud of. For adults with IDD, the SKY'S THE LIMIT! 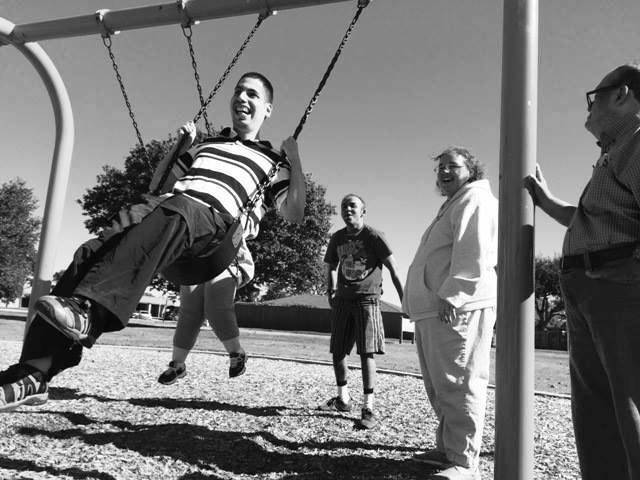 DREAM - We have a dream that was created in 2014 to have the finest continuing education center in North Texas for students with developmental and intellectual disabilities who have aged out of the independent school district special education programs. BELIEVE - Our dream took flight when a group of BELIEVERS came together and insisted our dream could happen. DARE - We faced a lot of challenges and discovered those challenges came because we are the FIRST organization to do what we are doing. DO - It's time to do it. It's time to BE the best education and LIFE skills training Center in all of Texas and possibly the United States! What does this mean for your student? A positive, extra curricular environment where the sky's the limit!